Chamberlain “Chaim” Jackslaw: Real SIN, UCAS. Deck license. Silent Meadow: R4 fake, professional Miracle Shooter player. R4 deck license. Chaim (as his friend(s?) 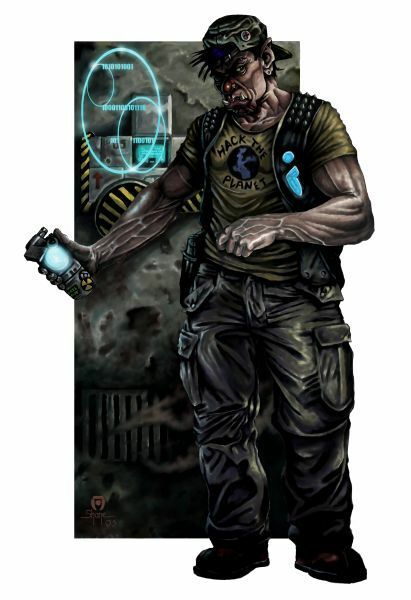 calls him) is a snotty ork decker with a deep knowledge of the various message boards on the web, from the friendly to the totally toxic. He usually posts as Drekbomb, his new street name. He is often physically accosted, due to his extreme arrogance, and a general unlikeability. He got into decking after getting large settlement payout from Stuffer Shack, INC. after they served him a dangerous chemical, injuring him and causing a severe allergy to grass as a side effect. Him and his bff Bailey Brunswick have both been dipping their toes into ’running, having been fascinated by the prospect for a while but lacking nerve. However, Bailey recently did a courier run for Pia Oliversson and brought along Chaim as matrix overwatch, and that served as their intro to the life. She is also responsible for delivering most of his food and equipment, which is how they initially met. He recently was very nearly killed on a run, saving the life of Alexander Horn and some other Crime Corp bosses from Tir Tairngire. They thanked him by sending him a custom deck upgrade and promising some future work. After being captured on a subsequent run, he was killed and eaten by Eion Smash while trying to escape through the tunnels beneath McNeil Prison.